Seminar -"Ayurveda Drug Manufacturing -Posibilities and Problems"
In association with CARe Keralam Ltd AMAI conducted one day seminar on “Ayurveda Drug Manufacturing -Possibilities and Problems” at CARe Keralam campus Koratty 0n 16 september 2012.The meeting chaired by Dr.G.Vinod Kumar (State President AMAI). Mr.Karimpuzha Raman (Managing Director CARe Keralam ) inaugurated the seminar. Dr.Sheela B Karalam(Oushadhi) spoke on 'Identification,adulteration and storage of crude herbs.Dr.C.I.Jolly spoke on “Quality control of Ayurvedic medicines”.Dr.Manoj Kaloor presented” The problems and solutions in Ayurvedic drug manufacturing.”Dr.Joy. T. Varghese described the activities of CARe Keralam.Dr.Jose Paikada moderated the section. Dr.Rejith Anand(State General secretary AMAI),Dr.Shafi Thashkent(State secretary AMAI),Dr.T.A Salim(Chairman,Manufacturing sub committee AMAI)Dr.P.K.Haridas (Convener, Manufacturing Sub committee),Dr.K.V.Syamlal(Managing Editor Apta) Dr.S.Sajikumar(MD,Dhathri)Dr.D.Ramanadan(MD,Sitharam),Dr.K.Anilkumar(KAPL) and CCIM member Dr.V.G.Udayakumar were also present. 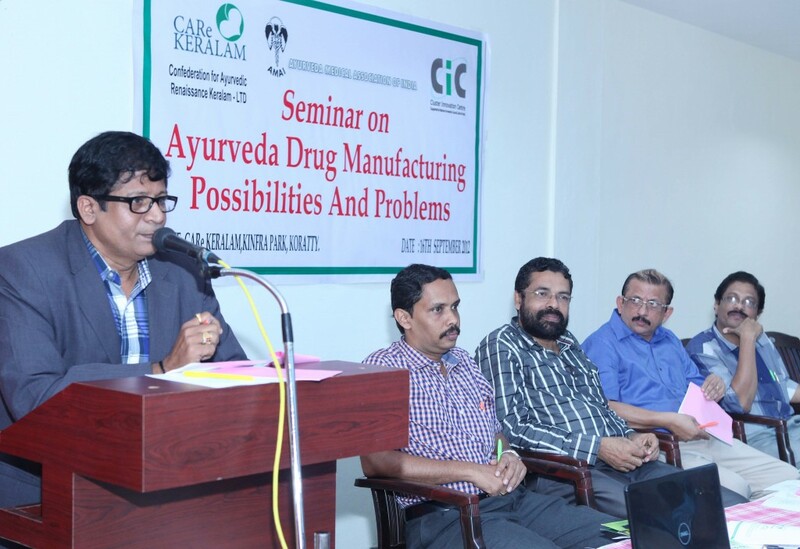 Comments Off on Seminar -"Ayurveda Drug Manufacturing -Posibilities and Problems"